Do you ever have one of those weeks?! You know the kind ….. Monday, followed by three or four more days that may as well be Monday too. Blah! I seriously hate weeks like that. They are the worst! It’s fair to say that life has been a little crazy around here and it’s put me in a funk. I’ve had a real lackadaisical attitude lately and it was starting to get to me. Nothing that a little friends and family time couldn’t cure! Our get-together wasn’t exactly planned – it was more of a spur of the moment kind of thing. Brian and I had some family over earlier this week and living out where we do, it’s not easy to get to the store. It’s a little bit of a drive. So, I have to be prepared all of the time! Being prepared means, I always keep RITZ® crackers on hand. Always. 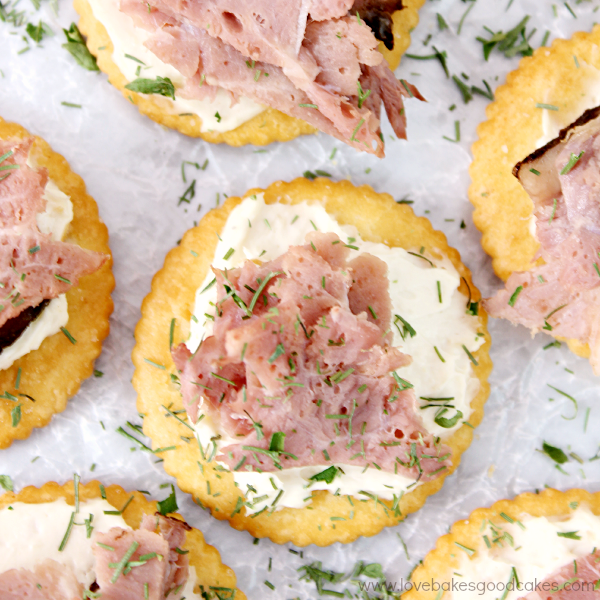 You never know when you will need a quick appetizer or snack idea! 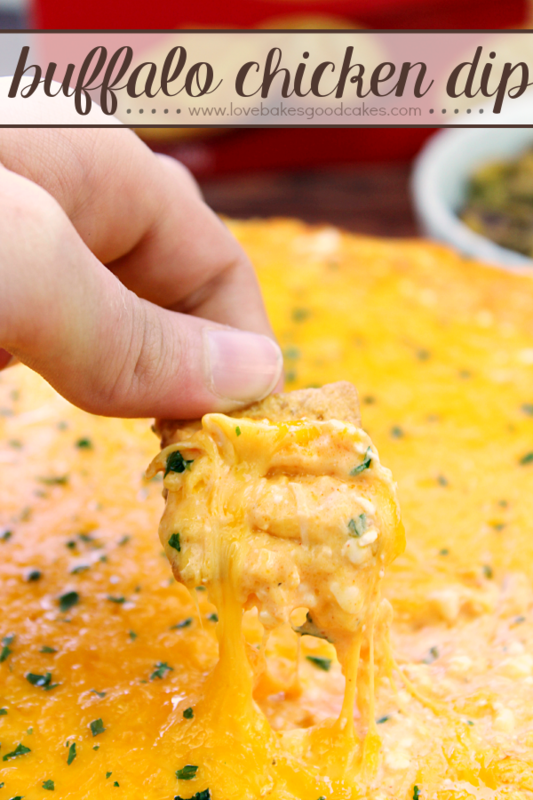 I know RITZ® crackers are delicious by themselves or with all sorts of toppings and dips! Honestly, some of the best topping ideas aren’t even planned …. they just happen! For instance, I had some leftover roast beef from wraps we had the day before. 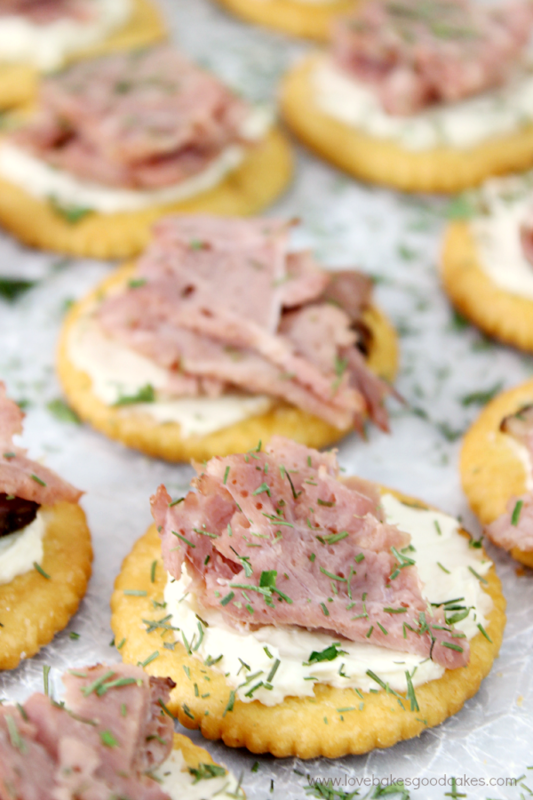 It was easy to use the leftover roast beef with a few other ingredients I had on hand to make these Roast Beef with Horseradish Cream Cheese Snack Crackers to enjoy with the family! It could not have been easier or more delicious! With RITZ® crackers, the possibilities are endless! Speaking of endless possibilities, on your next trip to Walmart, be sure to pick up a box (or two!) 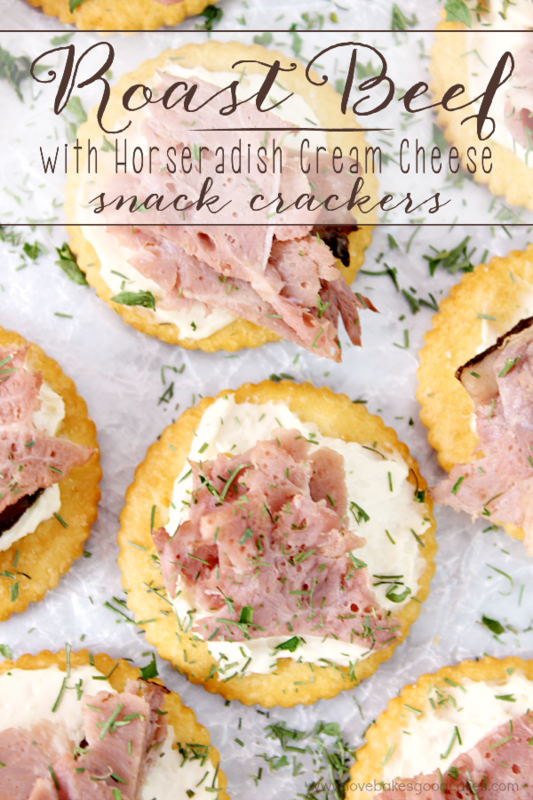 of RITZ® crackers so you can make this awesome and easy Roast Beef with Horseradish Cream Cheese Snack Crackers recipe and so you can enter your creation in the RITZ® Snackify Challenge Instagram Contest! That’s right, come up with your own creation using RITZ® crackers for the chance to win some prizes! 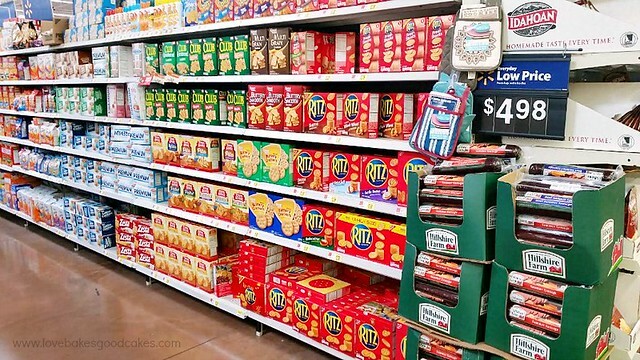 You can find RITZ® crackers near the other crackers! 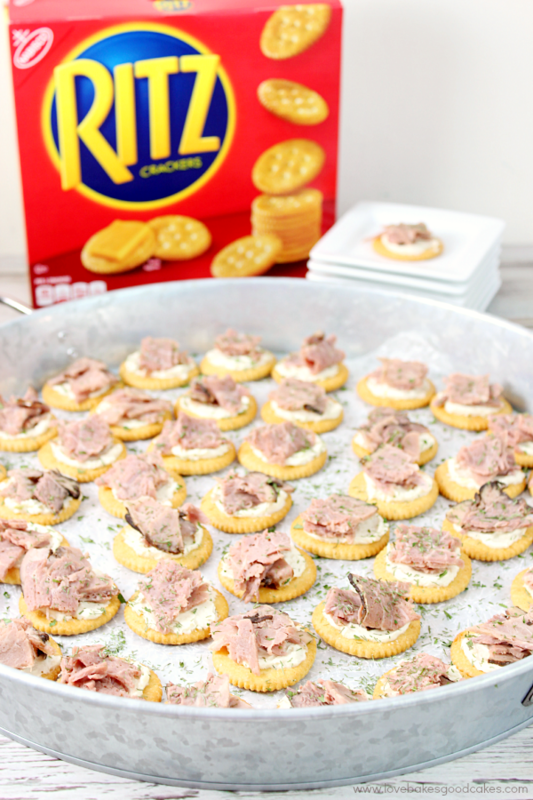 You can enter for a chance to win one of forty $100 Walmart e-Gift Cards (10 per week) by uploading an Instagram photo of your RITZ®-topped creation with #putitonaritzcontest. Purchase of RITZ® is not required. 1. In a mixing bowl, combine the cream cheese, horseradish and Dijon mustard with an electric hand mixer until well combined. 2. 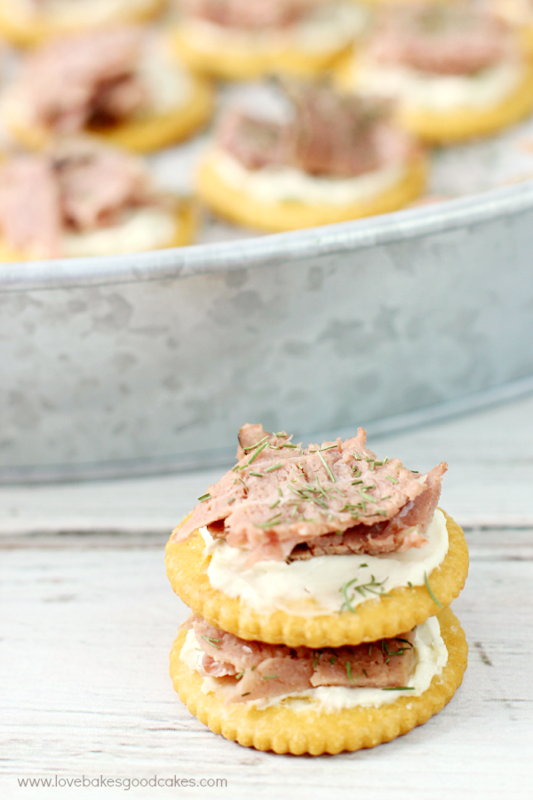 Top RITZ® crackers with the cream cheese mixture. Add roast beef to each cracker. If desired, sprinkle with chopped parsley or dill weed. Serve immediately. Note: You can prepare the cream cheese mixture ahead of time. Keep it refrigerated until needed. Allow cream cheese to soften before use. Do not top the crackers until right before serving time to keep them crisp! « More than 50 yummy Grilled Cheese recipes! I can't imagine not being able to get to a store quickly and easily……but Ritz are a great thing to have on hand! 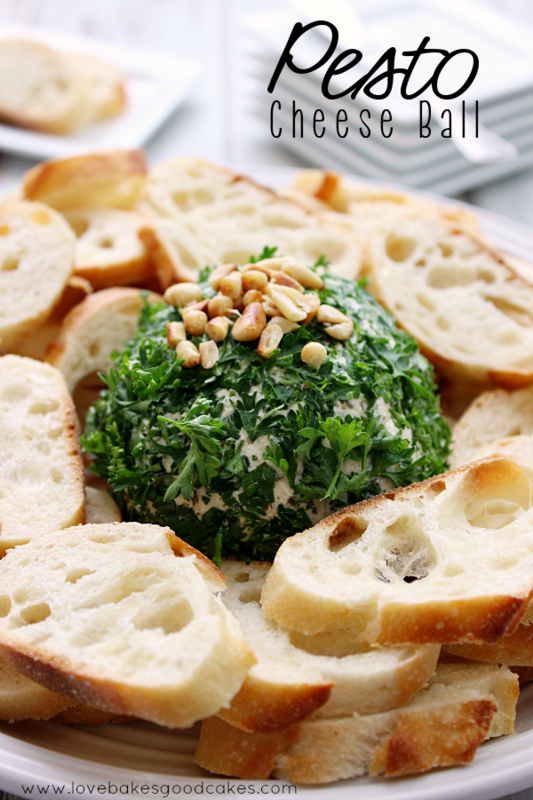 This looks like an appetizer that everyone would love! The hubby would love this flavor combo! Roast Beef with Horseradish is one of his favorite!! Gotta try this for movie night at The Ranch! !